Cement-treated base (Cement Treated Base) (CTB) is a strong, frost-resistant base for a concrete or asphalt pavement wearing surface (read more). 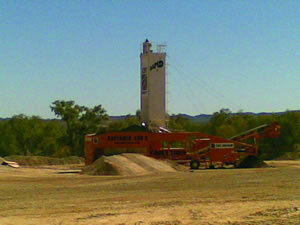 CTB is comprised of native soils, gravels/manufactured aggregates mixed with cement and water. CTB is well known for providing a weather resistant base which actually gains strength with age. It can distribute loads over a wider area, reducing the stresses on the subgrade. It is typically used as a pavement base for roads, streets, car parks, airports, materials handling and storage areas. The aggregate/granular material, cement, and water are typically mixed in a central mixing plant. Central plants can either be continuous-flow or batch-type pugmill mixers. Pictured above, Woodruff and Sons, a general contractor located in the state of Florida, USA, used the Rapidmix capabilities to produce high quality CTB using recycled concrete on a variety of projects in Florida and Northern Indiana.